Just like snowflakes, no two sisters are alike. The heroines enjoy a snow day in their own unique ways independently, but then reunite for a surprise! Mentor Text; Six Traits of Writing – Word Choice: The use of clear, succinct language, coupled with beautiful illustrations makes Snow Sisters! an excellent model for teaching word choice. Read through the story and ask students what they notice about the use of language and the organization of the text. How do the pictures enhance the minimal text? A humpback whale travels along the Pacific coast, but hidden in the water is a forgotten fishing net. 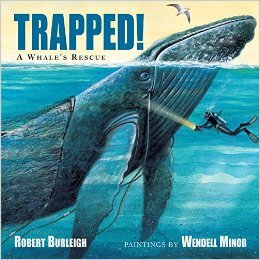 When the whale becomes trapped, the story, based on a true event, reminds us of the important connection between humans and animals. as a mentor text to model great word choice. Disclaimer: I received this book from the publisher for review. An informational book written in rhyme tells the story of a mouse in the meadow and the other animals who live there. Mentor Text: Narrative Nonfiction/Word Choice: Read aloud The Mouse and the Meadow in a study on habitats in a meadow. Discuss how the author shares information in a narrative way. Consider using The Mouse and the Meadow as a mentor text in writer’s workshop. After a study of habitats, ask students to write a narrative nonfiction piece emulating The Mouse and the Meadow . Additionally, the language the author uses brings the story alive. Discuss how the author’s word choice helps develop the story while remaining true to the scientific concepts developed in the story. Finally, Dawn Publications has created an interactive app to go along with the book. Download the app and watch the animals become 3-D as it reads aloud the story. It’s a pretty neat experience.